Hi guys, I'm Olivia from DIY Mother! I'm here today because Elizabeth has been kind enough to let me share one of my DIY projects with you. Let me preface this tutorial by saying that I'm not an entertainer by nature. While I love to cook and bake for my family and friends, the idea of having a group of people over at our house "just for fun" kind of scares me. Don't get me wrong, I'm thankful for the 2 or 3 times a year I get to have extended family at our house to spend quality time, but I'm not going to be hosting dinner parties any time soon. We're coming up on one of 3 times I do entertain in a few weeks. My daughter is turning 2 at the end of the month, and we're having both sides of the family over. It's guaranteed to be chaotic. So I decided to finally DIY something I've been thinking about for months: a slate tile table runner for serving hot dishes. I never use a table runner for our kitchen table because they just get messed up by our toddler, so I've been toying with the idea of making a more "permanent" runner out of slate tiles. Slate just reminds me of prehistoric times and if it could withstand hot lava and fire, it can probably withstand the heat from a hot chicken casserole. Follow along with me as I show you one of the easiest DIY projects I've dreamed up and then done! If you like it, check out some more of my projects over at DIY Mother! What you'll need: Natural stone Rug gripper (24-in. x 84-in., the size of a rug runner) Felt (Or foam sheets, like I used) Adhesive (I used this) Scissors First, I measured the runner rug gripper on my kitchen table. The gripper was a little too wide, so I folded it in half. I also cut it so that there was no excess gripper running off the ends of the table. I originally planned on gluing the tiles to the rug gripper, but the gripper has a bunch of tiny holes in it so I figured I'd need something to "catch" the glue. That's when I found some foam packing sheets and thought it would be perfect for the table top. I glued the gripper to the foam sheets and let it dry. I flipped the gripper over so that the foam was at the bottom and the rug gripper faced me. Then, I started laying out the tiles on top of the rug gripper. The rest is pretty self-explanatory...just keep tiling, just keep tiling. And here it is in all its glory. And yes, I cooked that chicken from scratch. Just kidding..this was one of our HEB dinner nights; it looks homemade though, right? Looking back, I probably should have only used 2 rows, but I'm happy with how it turned out. The best part is that I can easily fold it up and store it in our closet. Obviously I'm still enjoying it, so I have yet to hide it in the closet. Plus, Thanksgiving is only 3 months away! This thing is perfect for Thanksgiving dinner. Wow that is so creative and unique! Looks great! What a beautiful looking table runner! I love how the slate looks on the dark table. Was it expensive to buy the slate? so pretty. thanks for sharing. i cant wait to try this runner out. this is so amazing! i've never seen anything like this before but thank you for letting me be aware of it! i hate table runners, most are so tacky. Love this! That looks so amazing!! I would never have thought of using slate like that. I love this idea. 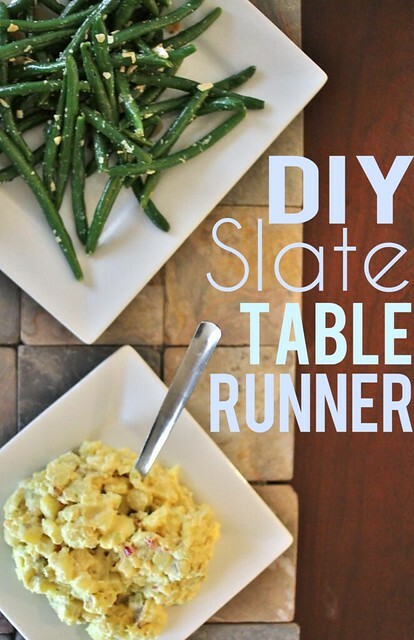 It looks great and is a good way to keep hot plates off the table without bothersome fabric runners or pot holders. thanks for sharing how you did it! This is such a cool idea. I am going to try and make one for a gift for my sister. It would look great in her dinning room at the lake. Thanks for the fantastic idea! This is a lovely project to do. I would like to have this for the holidays also. Ooh I love how this looks!! So awesome and super easy to clean too! !